Click Here to take an Interactive 3D tour of the Automated Parking Garage. Shuttle systems utilize transfer cabins to park and retrieve vehicles from the system, autonomous robots to move vehicles to and from elevators and parking spaces, and lifts to gain access to multiple floors or height variances. The number of vehicles deep that are stored in a parking space may vary, however the deeper you nest the vehicles, the longer it takes to retrieve the ones parked in back. Some systems do not use platforms (named trayless systems) to move the vehicles around. The trayless aspect of the system is facilitated by a robot with roller arms that lift the vehicle by its tires. Basically the robot positions itself under the vehicle and then swings its arms out to scoop up the tires. Lifts are used when multiple floors or level transitions are employed. Some are designed to transport the robot along with the vehicle, others just allow the vehicle to ride. Based on the design of the system, rotating a vehicle (so it can be driven away forward) can be accomplished in the transfer cabin, on a robot or at designated locations within the parking system. Listed below are some of the benefits of the DSS-MP trayless shuttle system. The automated system’s architecture is based on intelligent subsystems, each having its own PLC and functions. Should a part fail, the unaffected components operate independently to assume control and operation of the system without any data loss, providing a high level of redundancy. Commands and communications are uninterrupted. 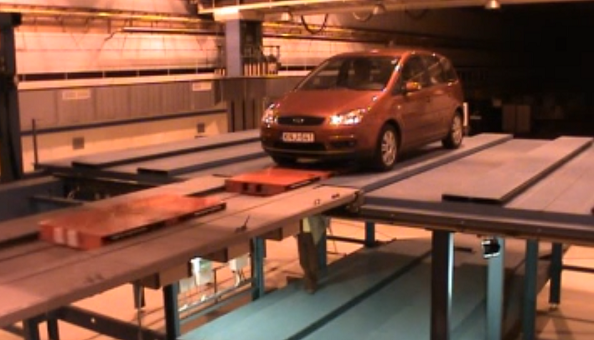 The speed of operation depends on the weight of a vehicle (measured during the entry process). All automation and electrical components are sourced from Siemens (a well recognized supplier) thereby avoiding compatibility problems. 24/7 service and support is provided around the world through Siemens’s global network. No hydraulic or pneumatic parts are used. Only industrial to industrial hardened components are used in the complete system. Designa is used to provide the user access control system. Meru Networks is used to provide wireless communications between components (their fourth-generation Virtual Cell WLAN system is used). 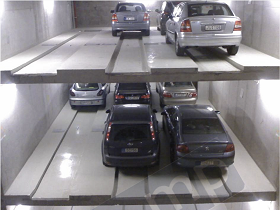 The flexibility of the automated parking system allows a possible design/build of parking lots for almost any size of plot and topography, including those in which a conventional parking lot or other parking systems could not be accommodated. During construction a smaller footprint and shorter construction time is realized, and certain conventional parking equipment (eg. lifts, staircases, ventilation, lighting, etc.) is no longer needed. Commercial Products are designed for internal, precisely managed environments such as a found in communication rooms and offices. Equipment is designed to operate in temperatures around 32°F to 104°F, and with a design life of 5 to 7 years. This equates to more frequent maintenance on worn equipment. Industrial Products are designed for more challenging environments such as factories and warehouses, often mounted in metal (>IP54 rated) cabinets, on DIN rails or directly onto panels, and having an operating temperature in the range of 14°F to 140°F (Industrial grade) to -40°F to 158°F (Industrial Hardened). Design life is 15 to 30 years, equating to less frequent maintenance on high wear equipment. So the take away is WRAP/DSS will install a parking system that is industrial rated for all its components, resulting in a stable and long lasting system for the environment it is being installed into. Worldwide Robotic Automated Parking, LLC. 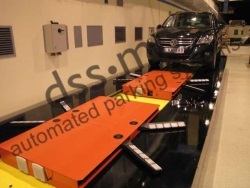 is the premium supplier of both Fully and Semi automated parking systems. Dependent on your project's needs, we can provide a fully automated / robotic system or a simple mechanical parking system. Discuss your requirements with our knowledgeable staff today, and discover the perfect parking system fit for your project's needs. Your questions regarding mechanical, automated, or robotic parking is typically responded to within 24 hours. 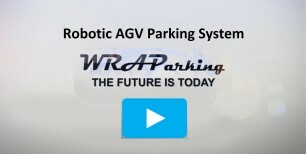 WRAP (Worldwide Robotic Automated Parking, LLC. ), Website © Copyright 2014, 2015, 2016, 2017 All Rights Reserved.